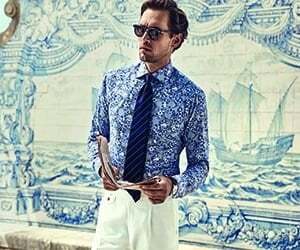 This shirt stands out with its soft design as well as its high quality and comfort while suiting both casual and formal looks. Wear it with a sophisticated tie and a double breasted suit for a superb business look and opt for a stylish suede jacket and some white sneakers on the weekend. The unique texture combined with elegant draping and unquestionable durability makes this shirt an essential piece in your wardrobe, easy to match with any outfit any time of the year.